Alright, big apologies for lagging in my posts!! New baby, winter blues and getting back into the swing of things at work have been taking up my time. Did I mention that we moved to a slightly larger apartment when the baby arrived? Actually, we tried to beat his arrival and ended up moving THE SAME WEEKEND he made his appearance, so it was fantastic timing. I think it was worth it though, because with the new apartment comes a dishwasher, a back yard, an ATTIC space and we're right next to laundry... It also comes with electric heat and a weird jacuzzi bathtub that has no shower, so it's a give and take. It is also still a one bedroom, so even if the baby sleeps through the night (which is amazing!!) I still usually hear his sleep screams and so I look forward to a future with a separate nursery. 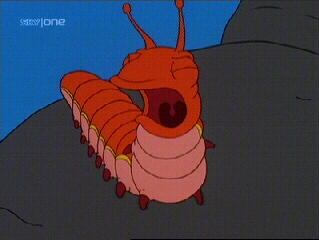 The Screamapillar - "I should hear sleep screams! *"
ANYWAY, I received a few links to this amazing Buzzfeed article about insanely great things for small apartments and so naturally I had to do a round up of the ideas. There are a lot of great things on this list, so I'm splitting up the list into different posts and including my faves that I will be implementing ASAP. Everyone knows that wine racks take up a ton of space, but are a total necessity no matter how small your apartment is. We have actually had one of these for a long time, although on ours the bottles slide all the way through the center so it only holds about 5. 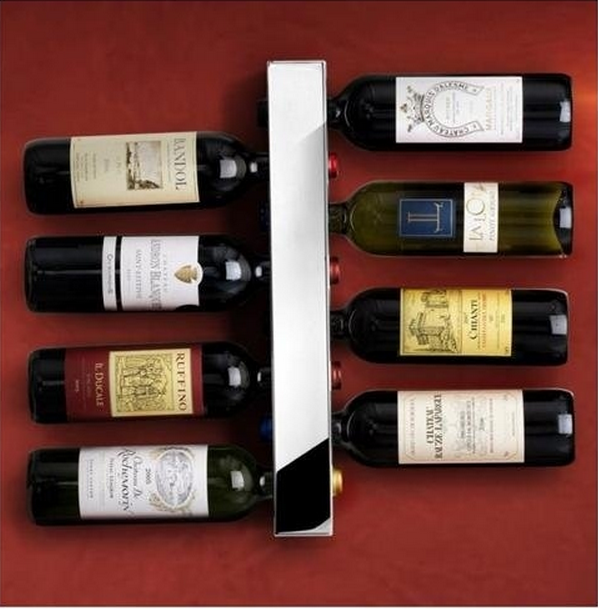 It does take up much less space then a traditional wine rack, so if you can find one that holds 8, I say go for it... One that holds 16 would be even better. I am going to order one of these tomorrow. I had the magnetic spice rack in our old apartment, which I loved, but it doesn't fit in our new kitchen, so now I have all my spices in a humble jumble taking up precious cupboard space. 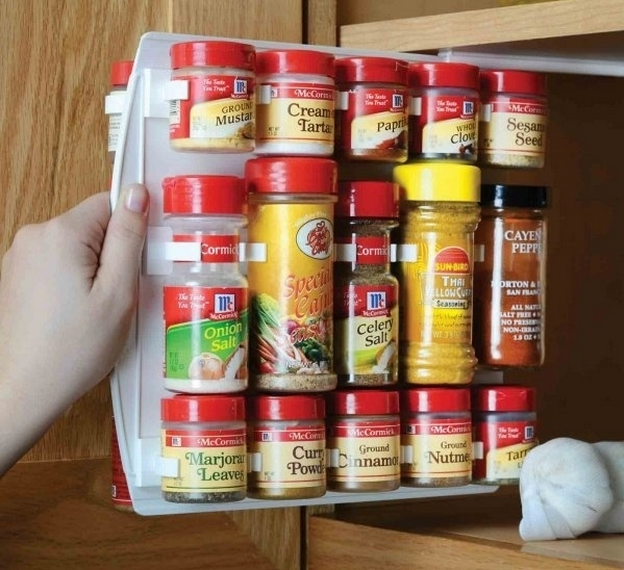 This looks like it easily fits in most cupboards and more importantly you can see all the spices without having to move every single one every time you are looking for the parsley. Why is it that every spice I need is always blocked by celery seed???? If you can't find a way to scrounge up for this knife set, this under-cabinet knife storage is fantastic. 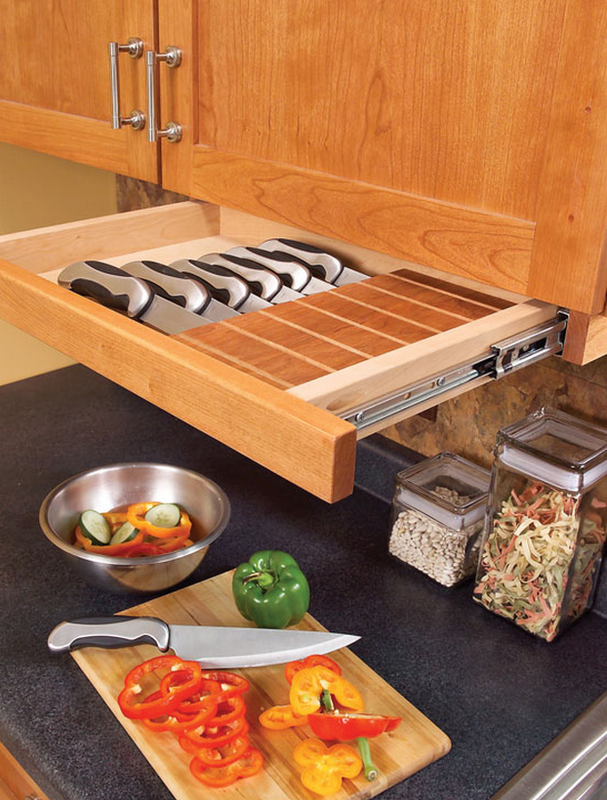 It hides the knives away so you don't have to look at them, but is easily accessible to where you do the most chopping. I would consider this an add on if you ever design your own kitchen, but I thought it was such a good idea that I had to include it. You might not want to put this kind of effort into a rental apartment, but if you do enough cooking, and have a limited counter space, it might be worth it. I think this invention is absolutely BRILLIANT and frees up a lot of space if you don't want a coffee table in the way of your living room/dance floor/baby play pen. 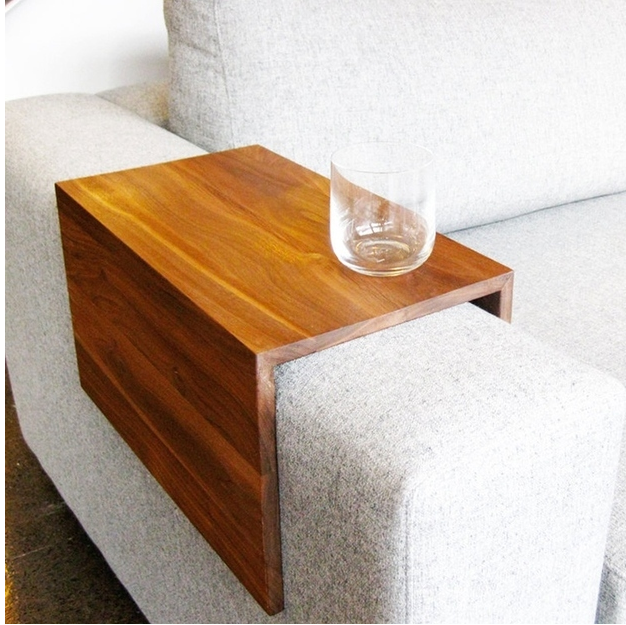 Many people use collapsible trays in lieu of coffee tables to save space, and this little contraption makes it so much easier to have a drink with no table... I mean really, this is one of those "why didn't I think of that???" And on Etsy, these are going for anywhere between $65 and $230, so if you are crafty and have access to a jigsaw/wood glue, you could probably make one yourself. Oh, but you're lazy like me? Find one ready-to-buy here. *What???? You aren't familiar with this character? Then you clearly aren't as obsessed with the Simpsons as Bill and haven't memorized every episode ever made. Seriously, I have no idea how he can fit all the sports trivia, Seinfeld quotes, Simpsons episodes, Harry Potter plot lines AND still have room to remember family members birthdays. I will make a pie chart of what I imagine his brain to be full of and post it next time.